Want more info? Read a fun article about this class! "In this fun and easy guitar class, aimed at total beginners, you'll learn how to stop dreaming and start playing the guitar right away..."
Live in or near Seattle or Bellevue? In this beginning level guitar class, you’ll learn how to stop dreaming and start playing guitar in a single day! Learn to Play Guitar in a Day!, as seen on PBS, is a unique one day workshop for busy adults and aspiring musicians of all ages who would like to play guitar but may not have time for weekly lessons. This is the quickest and easiest way to get far more than just a start; during this fun filled day you’ll learn basic chords, simple strumming and picking patterns, play familiar songs, learn tuning techniques, guitar care, basic music theory, music resources, tablature, performance skills and more. In no time at all you’ll be playing guitar! Materials fee (due in class): $30 for the Learn to Play Guitar in a Day! book and an electronic tuner. Students provide their own acoustic guitar for the workshop. Please bring cash to the class. This fee is NOT included in the tuition. 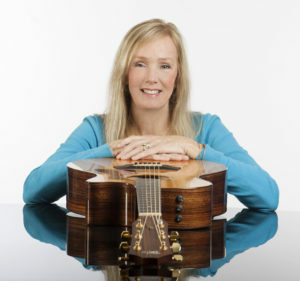 Marlene Hutchinson, guitar instructor, musician, published author, producer and founder of Marlene’s Music, developed a simple method of learning to play guitar that has influenced and inspired guitarists around the world. 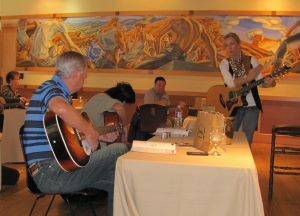 She presents her popular Learn to Play Guitar in a Day!® workshops at universities, colleges and guitar festivals/events around the United States. Her DVD airs on PBS and she has been featured on CBS, NBC, NPR, Acoustic Guitar (magazine), the Women’s International Music Network and several news print publications. Learn to Play Guitar in a Day! is a 2014 Player’s Choice Award nominee.